We have long been told that corporations rule the world, their interests seemingly taking precedence over states and their citizens. Yet, while states, civil society, and international organizations are well drawn in terms of their institutions, ideologies, and functions, the world's global corporations are often more simply sketched as mechanisms of profit maximization. 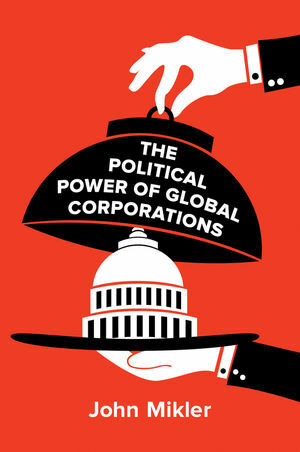 In this book, John Mikler re-casts global corporations as political actors with complex identities and strategies. Debunking the idea of global corporations as exclusively profit-driven entities, he shows how they seek not only to drive or modify the agendas of states but to govern in their own right. He also explains why we need to re-territorialize global corporations as political actors that reflect and project the political power of the states and regions from which they hail. We know the global corporations' names, we know where they are headquartered, and we know where they invest and operate. Economic processes are increasingly produced by the control they possess, the relationships they have, the leverage they employ, the strategic decisions they make, and the discourses they create to enhance acceptance of their interests. This book represents a call to study how they do so, rather than making assumptions based on theoretical abstractions. John Mikler is Associate Professor in the Department of Government and International Relations at The University of Sydney. "Few would deny that global corporations are immensely influential. They dominate markets and have profound influence over technology, prosperity and the environment. John Mikler's brilliant study of how they share political power with government provides a cogent and perceptive analysis. It is a landmark in one of the most crucial yet under-emphasised debates in contemporary social science. Corporations structure our present and define our futures, to understand their power requires Mikler's masterful, wide-ranging and richly illustrated exposition." "This book provides a timely and highly needed addition to the literature on corporations as political actors in today's global political economy. Mikler's strategy to reterritorialize corporations and specifically corporate power in geopolitical terms allows fascinating perspectives on actors typically considered in terms of transnational characteristics." "This readable book is a worthy addition to the literature." "More than a theoretical call to action, this book also offers practical entry points to the study of corporate power—including global corporate agency, questions of state power, national institutional varieties, and corporate-level private authority. Broad, sophisticated, and highly accessible….it will surely be a valuable introduction for students and scholars of international studies that want to work on broadening our understanding of global corporate power."